Despite their reputation as startup tech hubs, San Francisco and Boston aren’t the only cities where startups can shine. In fact, they’re not even among the best. 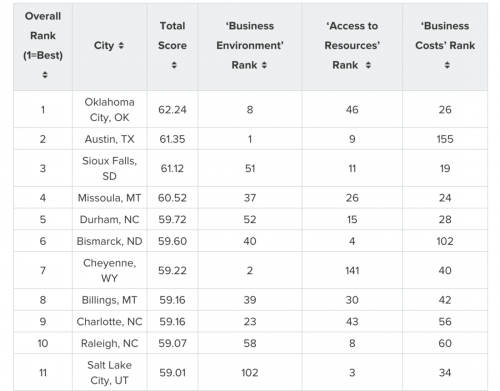 A new report from personal finance website WalletHub crunched the numbers and found they don’t even crack the top 20, when it comes to the best large U.S. cities to start a business. Instead, Oklahoma City landed the No. 1 spot, followed by Austin, Texas; Sioux Falls, S.D. ; Missoula, Mont. ; and Durham, N.C., according to WalletHub. Comparing 182 U.S. cities across 19 key indicators of startup viability, Wallethub looked at data such as the length of the average work week, average growth in revenue, the five-year business survival rate, the prevalence of investors, the cost of living, office space affordability, and corporate taxes.